The bloodiest battle of the Civil War took place on September 17, 1862, on Antietam Creek near the small town of Sharpsburg, Maryland. Four hours of intense fighting took place on an old sunken road that separated two farms. A staggering 23,100 men were wounded, killed or missing in action after the Union and Confederate Armies collided in the nearby cornfields, farmlands and Antietam Creek. 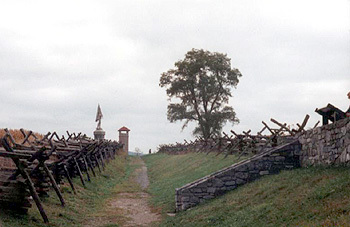 When the Confederate Army reached the sunken road, which provided some protection at first, General Robert E. Lee ordered that the battle be held there. Soldiers on both sides fired continuously as the Federals tried repeatedly to overtake the position. Finally the Confederate soldiers were overrun and bodies fell on top of bodies in the bloodied sunken road. Today we know it as Bloody Lane and if you ever have occasion to walk it you will indeed go back in time and be humbled by the experience. The tragic impressions of that day seem to linger. It seems that no matter how many visitors roam the old road on any given day, it remains church-like quiet. The Sunken Road- later renamed the Bloody Lane- where more than 5,000 Union and Confederates lost their lives. 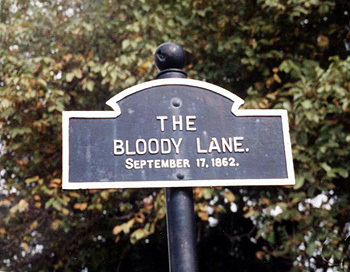 According to eyewitnesses, Bloody Lane is haunted. Gunfire and the smell of gunpowder have been reported when no one is on the road or even nearby. One visitor to the battlefield saw several men in Confederate uniforms walking Bloody Lane. He thought they were reenactors until they vanished. The most convincing of the reports is the one of some Baltimore schoolboys who walked Bloody Lane and heard singing out in the fields. They said it sounded like a chant or the Christmas song Deck the Halls. They heard a chant similar to Fa-la-la-la-la sound repeatedly. The area was near the observation tower where the Irish Brigade charged the Confederates with a battle cry in Gaelic, which sounded like the Christmas carol. Another haunted area is Burnside's Bridge, known then as Rohrback Bridge, where General Ambrose Burnside pushed the Confederates back after many defeated attempts. Many soldiers were buried quickly in and around the bridge in unmarked graves. Visitors at night have reported seeing balls of blue light moving around the sound of drum playing cadence as it fades into the night. Perhaps the Battle of Antietam is not over for some restless spirits. The Pry House and The Piper House stand on the battlefield. Both are reported to be haunted- stories ranging from footsteps heard on the stairs to apparitions of a woman thought to be the wife of one of the generals who died in the house. The St. Paul Episcopal Church in Sharpsburg was used as a Confederate hospital after the battle. Reports tell of the screams of injured and dying still coming from the building. Others report seeing flickering lights from the church's tower. The wounded were taken into nearby Sharpsburg to the church and into people's homes to be cared for and many of them died there after surviving the horrendous battle. There is a house west of the town of Mt. Airy where some of the wounded were taken. Legend has it that the floorboards in the house are still stained with blood and cannot be removed even with sanding. Rickie Longfellow is a member of the West Licking Historical Society, Smithsonian Institute, and the Daughters of the American Revolution.